Valla Beach is one of the luckiest coastal communities in Australia as we are blessed with nature reserves adjacent to our community. We have Jagun Nature Reserve to the north and Valla Nature Reserve to the south plus some spectacular dunal systems in between. We are especially lucky in that all of these are in pretty good condition both structurally and in respect to the level of weed infestation. The latter is due in part to a very active group of bush regeneration volunteers that meet regularly and work in cooperation with the two land managers, National Parks and Wildlife Service (NPWS) and Nambucca Shire Council (NSC). However, our parks and reserves are under constant threat from weeds and in recent months we have noticed an increase of invasive plants that originate in residential gardens. 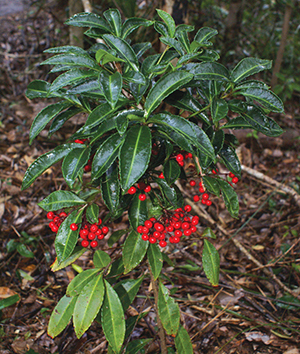 Right now we consider the most serious of these to be Coral Berry (Ardisia crenata). The photo (right - credit to Sydney Weeds Committees) shows why we have this problem - those beautiful red berries are 'bird lollies' especially favoured by Currawongs amongst others. The birds eat them, fly into the reserves, perch on a branch, digest the berries and eventually excrete the seeds. This plant appears to love our moist climate and it is not unusual to find groups of 30 or more healthy plants beneath a roosting spot. In May 2016, one small patch of Valla NR was weeded by a group of 7 people who removed well over 1000 seedlings, and some mature plants, in just one 3 hour period. Some of these mature plants also had ripe berries so they were caught in time. But that was just a small area and also just this year's crop so there are probably several more plants just waiting to emerge when they think the coast is clear. The group would love to have more volunteers but we realise that it is not for everyone (although the Tim Tams are a delicious reward). What is more achievable is to make our community aware of the problem and ask them to remove any of these plants if they are in your garden. You can contact a member of the team and someone will come round and do it for you as we have done in the past. Contact the NPWS Ranger Lynn Rees in Coffs Harbour (02) on 6652 0909. She will then notify the Bushcare group who will get in touch with you. Click here for more information on this weed.